In the ﬁrst of a major series looking at the evolving role of general practice within the cancer patient journey, specialist GPs Steven Beaven and Bridget Gwynne set the scene with an overview of cancer from a primary care perspective. Here, they examine changes in cancer incidence and survival, explain the concept of “overdiagnosis” and highlight the beneﬁts of early diagnosis. Life for general practitioners seems ever-changing. Contractual requirements are different every year and at the same time our patients are becoming more obese, tend to live longer and acquire more long-term conditions. We, as GPs, are able and expected to offer ever more care to our patients, and pressures mount with expectations about treating chronic diseases and patients with multi-morbidity. Recognition of patients with a possible cancer diagnosis in primary care is challenging. Many patients present with symptoms that are vague or do not “fit” with referral guidelines.1 Access to diagnostics such as scanning and endoscopy has historically been variable, but is now improving. All GPs are aware of the impact of cancer diagnoses that are perceived by patients or their families as being “delayed”, but at the same time we are aware of our responsibility to use limited resources wisely, and there is a continuing debate about appropriate thresholds of risk that should trigger a referral. Many people who have survived cancer, or are living with incurable disease, are now regarded as having a long-term condition. 2 These survivors may have late effects from their cancer or its treatment, and even those with metastatic disease may live for a long time with their cancer. Some people with metastatic colorectal or breast cancers, for example, may now survive for years with their disease, whereas twenty years ago survival would typically have been measured in months. Cancer statistics Statistics about cancer are available from many sources. National information is available from the Office for National Statistics (www.ons.gov.uk ), the Information Services Division (www.isdscotland.org), NHS Wales (www.wales.nhs.uk) and the Northern Ireland Executive (www.northernireland.gov.uk) for England, Scotland, Wales and Northern Ireland respectively. Information is also available from Cancer Research UK(www.cancerresearchuk.org/), and from several of the specific cancer charities. Statistics can be found for incidence, survival, trends over time and international comparisons. Firstly, the age-specific incidence of cancers has increased. These measures reflect the change in incidence that is independent of changes in the age structure of a population. 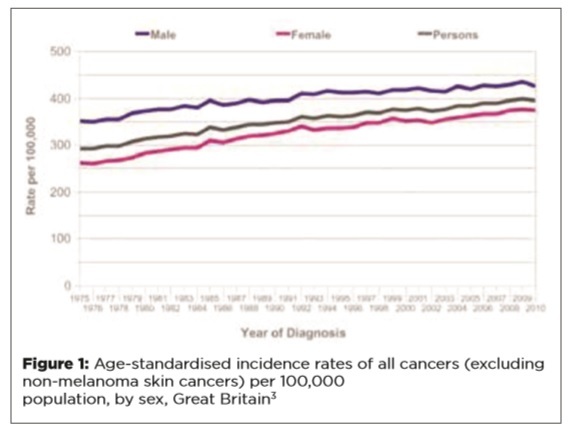 In the period 1975-77 to 2008-10, the age-standardised incidence rate for all cancers in the UK rose by 22% in men and 42% in women, as shown in Figure 1. Secondly, our population is increasingly elderly, and as cancer incidence is strongly age-related this contributes to the increasing incidence of cancer. 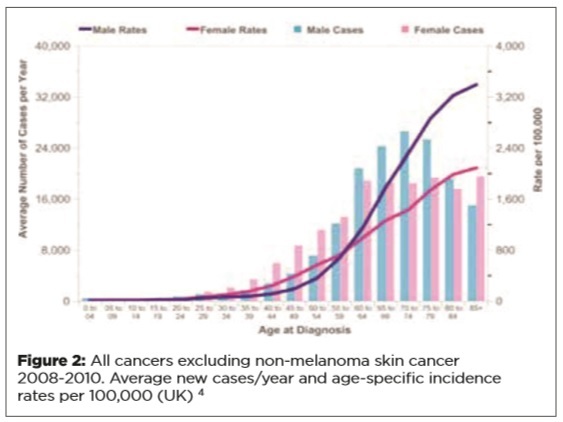 The incidence of cancer by age and new cases per year are shown in Figure 2. The highest numbers of new cancers are currently seen in the eighth decade of life, but the age-specific incidence continues to rise into the ninth decade. Case numbers fall in the ninth decade as there are fewer octogenarians than septuagenarians, but as life expectancy increases, this may change. The common cancers remain prostate, lung and bowel for men, and breast, lung and bowel for women, accounting for 53% and 54% of all cancers, respectively. For men, bladder cancer, non-Hodgkins lymphoma and malignant melanoma are the next most common, while for women they are uterine and ovarian cancers and malignant melanoma. 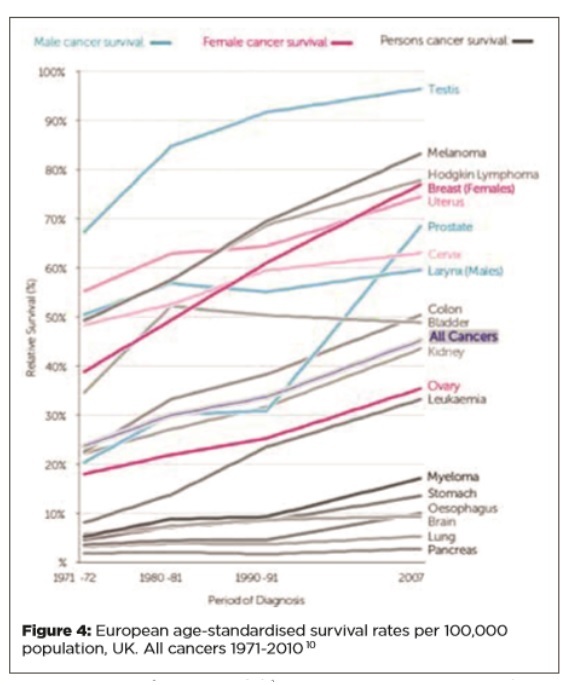 The incidence of some cancers (e.g. 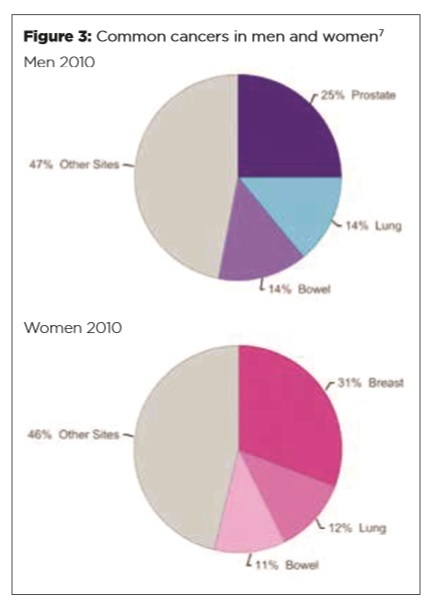 breast, prostate and bowel) has increased, whereas some, such as stomach and cervical cancers, have become less common. Lung cancers have become less common in men but more common in women, reflecting historical changes in smoking patterns. “Over-diagnosis” of cancers – the identification of cancers which would not have caused ill-health during an individual’s lifetime – has become a concern. A hallmark of over-diagnosis of cancer is where an increase in incidence has occurred without a corresponding increase in attributable deaths, especially where there have been no changes in treatments that would explain improved survival. For example, the increasing use of imaging (mainly ultrasound and CT scanning) has led to the recognition of small renal and thyroid cancers as incidental findings (so-called “incidentalomas”), which are likely to fall into this category. Screening for breast cancer has identified cancers which may be “indolent” and unlikely to progress. The recent Independent Breast Screening Review, chaired by Professor Sir Michael Marmot, 8 estimated that 19% of screening-detected breast cancers may be over-diagnosed but acknowledged the paucity of evidence available and pointed out the net benefit of mammography in reducing mortality from breast cancer. Identification of a cancer will always be associated with anxiety for patients. Staging of a cancer and grading of its histology may not differentiate important from “unimportant” cancers. In the absence of robust, reliable techniques to characterise the likely behaviour of a cancer, there is pressure to treat, with the attendant risks associated with treatment, both in the short term and as late effects. For example, 70% of men identified as having prostate cancer in societies where PSA testing is in widespread use are likely to have low risk disease, yet 90% of these men will get treatment, with attendant morbidity of erectile dysfunction, incontinence and bowel symptoms. The decision to adopt a “watch and wait” policy for a patient with a small renal tumour identified as an incidental finding is clinically understandable, but we must recognise and understand its impact. A diagnosis of cancer is always a significant event for the patient and family, whatever its “clinical importance”. General practitioners need to understand these concepts and to be able to discuss them with patients. Sharing uncertainties is challenging, but we have a responsibility to help our patients make informed choices. UK cancer survival rates have doubled in the last 40 years. Figure 4 demonstrates changes in survival between 1971 and 2007 which are attributable to improvements in treatment, for example the improved prognosis for testicular cancers. There have been developments in treatment of breast, colorectal and prostate cancers that are reflected in improved survival, but over-diagnosis will also contribute to improved survival figures. These patients will be a disparate group. Some may have no evidence of their cancer, they may remain well, and many may be regarded as cured. Others may have late effects of either their cancer or its treatment, be at risk of second primary cancers or may have recurrence of their cancer. Patients who have had a cancer commonly describe their illness as a life-changing event. The increasing number of survivors of cancer will turn to their primary care team for care, information and support. Early diagnosis – does it matter? For some cancers, there is clear evidence that earlier diagnosis is associated with improved survival. 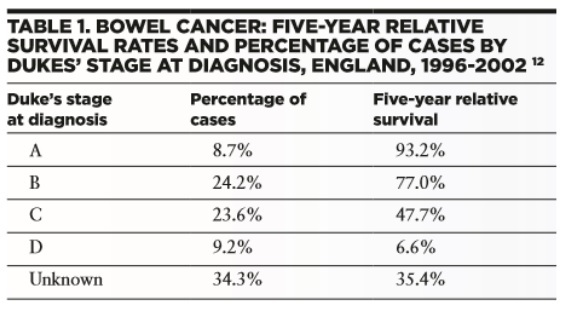 A good example is colorectal cancer, in which earlier stage cancers have markedly better survival figures than later stage cancers (Table 1). 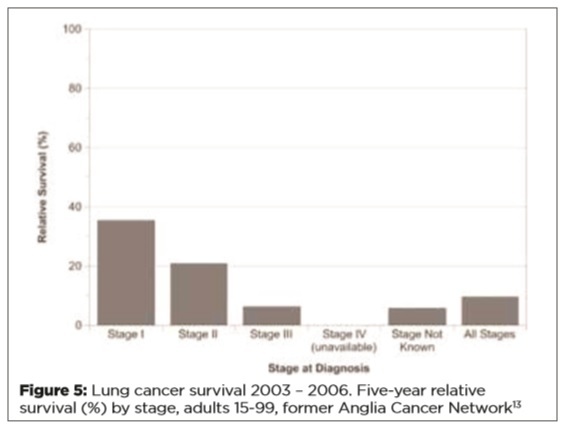 Lung cancers, with a much poorer general outlook, also show survival advantages associated with early stage diagnosis. Earlier diagnosis is associated with higher lung resection rates, which are in turn associated with improved survival. 14 Unfortunately, resection rates (and hence survival) are poorer in the UK than in some other European countries, and there are considerable geographical variations within the UK itself. Resection rates vary from around 6% in primary care trusts in the lowest quintile, to over 12% in the highest quintile. 15 This does not appear to be purely a function of deprivation, 16 but reflects variations in local services. Statistics for many other cancers – breast, renal, bladder, ovarian, melanoma – show survival benefits from early stage diagnosis. In some health services, patients have direct access to secondary care, thus bypassing the gatekeeper function of primary care. We face an increasing incidence of cancer, and as a consequence of increasing incidence and improving survival, many more patients are living with cancer and requiring our care. Our survival rates, while improving, lag behind those of many comparable western countries. We know that earlier staging at diagnosis is associated with improved survival. The challenge of earlier diagnosis in general practice will be addressed in the next article.